Perfect for industry or school use. Will resist punctures, water, and most chemicals. 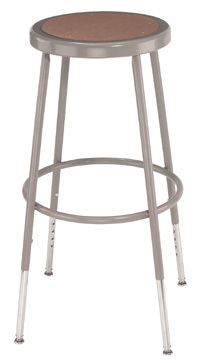 Complete with height-adjustable 18" diameter chrome foot ring. hinged backrest and 25" diameter reinforced nylon base. Seat is 1 1/2" thick x 18"w x 18" deep. 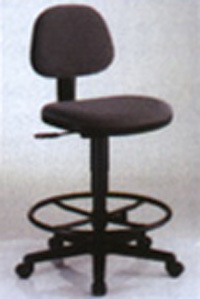 Backrest is 1" thick x 17"w x 12" h.
Includes a set of non-locking casters and a set of floor glides. Color black. Shipping weight 38 lbs. Pneumatic Height Adjustment at an economy price. Affordable, well constructed drafting chair. For home, office or student use. Pneumatic height control from 24" to 29". Construction highlights include extra stable 5-star metal base with double-wheel hooded casters. 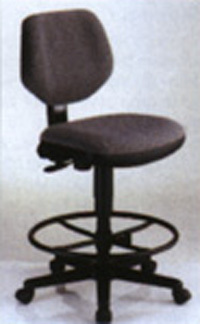 Comfortable 2" upholstered formed seat and adjustable backrest. Available in black or grey fabric color. Shipping weight 22 lbs. Available as computer or task chair without footrest. Deduct 7 1/2" from chair height, and $35.00 from price. Also available with plastic glides instead of wheels. Please specify. Features a high quality basic design at an affordable price. Ideal for home, office studio or shop. 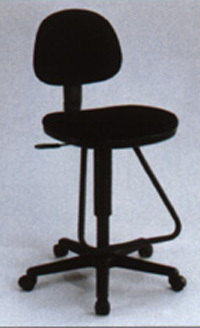 Pneumatic height mechanism adjusts seat height from 25" to 30". 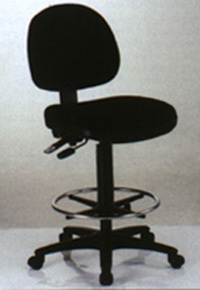 backrest height to provide full lumbar support. Upholstery fabric available in gray or black. by a 24" span 5-star metal base with double-wheel hooded casters. Full 2 year warranty on all metal parts. Ergonomically designed for long-lasting service and extra comfort. 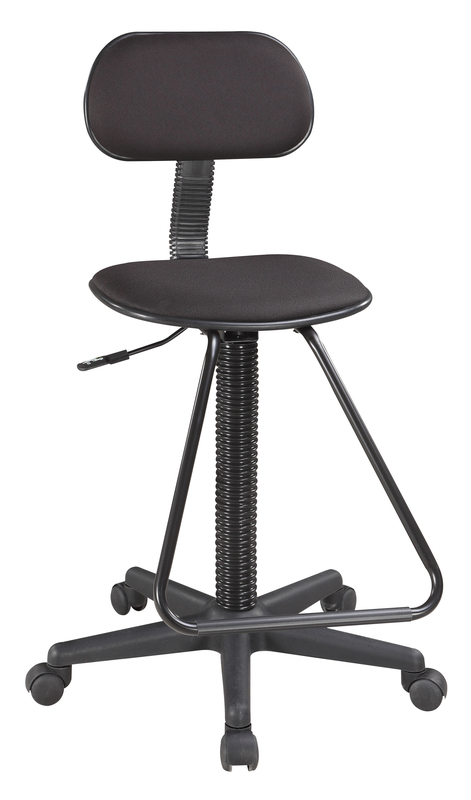 These chairs feature a gas lift mechanism that instantly adjusts seat height from 25" to 30". 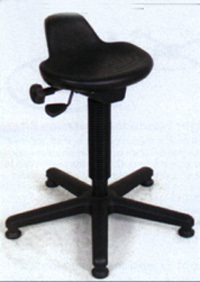 Handwheel adjusts backrest which adjusts which provides spring-action lumbar support. Extra large seat is contoured and cushioned for added comfort. Upholstery fabric comes in navy blue, black or medium gray. and is supported by a 24" span 5-star metal base with double-wheel locking hooded casters. Available with or without armrests. Shipping weight 22 lbs. Deduct 7 1/2" from chair height, and $28.00 from price. Incorporating quality ergonomic features in a rugged contemporary design. The 444 series is truly the ultimate in seating comfort. 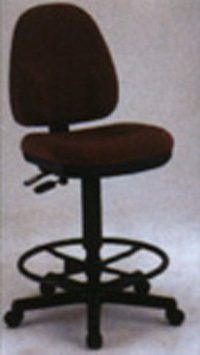 The smooth action gas cylinder mechanism adjusts seat height from 24" to 29". Backrest provides solid orthopaedic spine support, and full-size upholstered seat is contoured for added comfort. reinforced 5-star non-tip fiberglass base and double-wheel hooded design casters. Selection of fabric colors. Available with or without armrests. Deduct 7 1/2" from chair height, and $280.00 from price. Designed for the ultimate seating comfort. which adjusts forward and backwards, and higher and lower. 19" x 17" seat cushion, and optional armrest. The 555 has a two-lever two-lever adjustment system. One lever adjusts the seat and back to tilt forward or back with ease. that raises and lowers the chair from 24 1/2" to 30 1/2". Rugged 5-star black base for stability. 5 dual-wheel hooded casters for easy mobility. Styling, comfort and construction make this chair an outstanding value. the drafting version of this executive chair is unlike any other drafting chair on the market today. and a 26" diameter reinforced nylon base. The extra thick seat cushion is 20" wide x 19" deep x 3" thick. The backrest is 19" wide and rises 20" above the seat. CK49 height extension kit and adjusts from 24 1/2" to 28 1/2". Black leather. 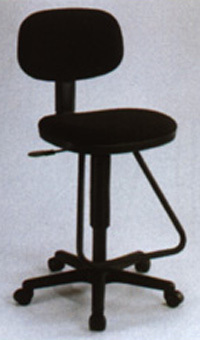 A deluxe drafting height chair for the draftsman/designer or busy artist. Comfortable and sturdy, this chair features an articulating seat and backrest. Adjustable foot ring and a molded 19" wide seat with 2" of cushion. Seat height adjusts from 24" to 34". 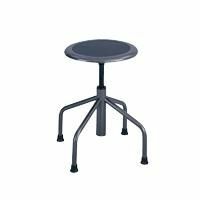 The reinforced nylon base is 24" in diameter with heavy-duty twin wheel casters. Shipping weight 40 lbs. The popular choice of the graphic designer. This contemporary drafting chair features a comfortable built-in angular footrest. Easy to reach pneumatic lever to adjust the height from 23" to 33". 12" backrest adjusts forward and backwards. 18" seat finished in durable nylon fabric. 5-star steel base with hooded double wheel casters. Reinforced ll metal frame and parts are coated in black durable finish. Choice of black or grey. Shipping weight 29 lbs. Offers a one-touch pneumatic height control, adjusting from 22" to 32". Comfortable black upholstered cushion seat and manual backrest adjustment for custom fit. Safety-size 5-star all metal base, with durable black powder coat finish. Complete with hooded dual casters. Shipping weight 18 lbs. Synchro-tilt mechanism tilts 6" forward and 7" back. Height adjustment from 21" to 30". The reinforced nylon base is 24" in diameter with heavy duty twin foot glides. 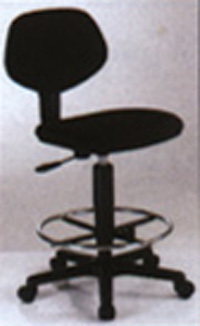 Has a swivel feature, pneumatic height control and an adjustable height between 18" and 26". 13" diameter seat made of super soft molded foam. Stable 22" diameter five-star base on hooded casters. Puncture resistant and easy to clean. 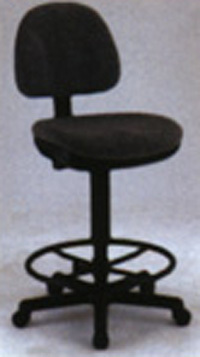 Black upholstered seat with height and depth-adjustable backrest. Pneumatic cylinder lift mechanism adjusts height. 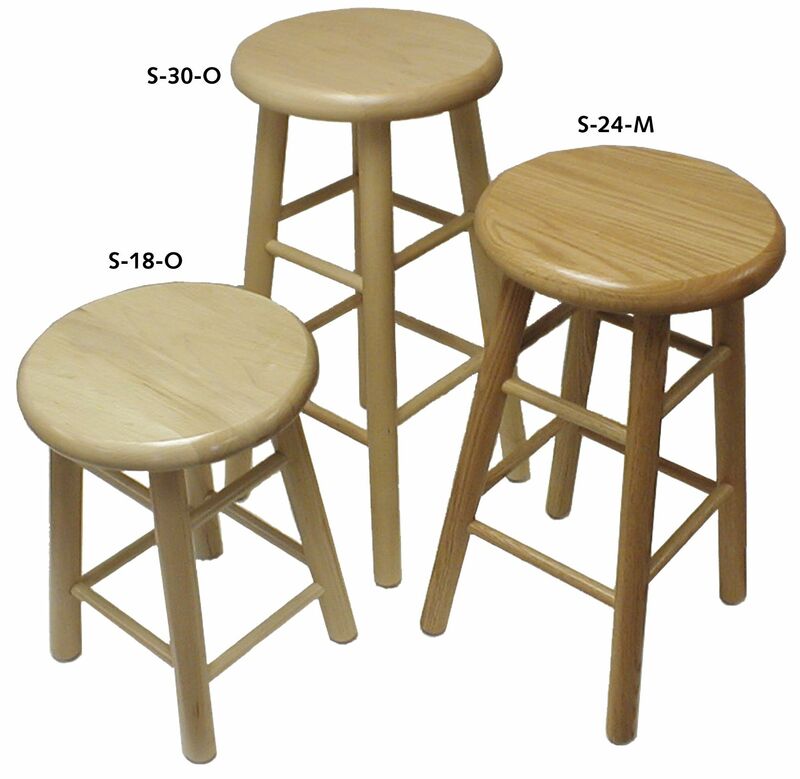 Sturdy 1�" thick, 13" diameter maple stools for the classroom or lab. 1�" diameter tenoned legs secured with screws into seat and draw-tight stretchers are glued and pinned at stress points. Heavy duty 18ga, 7/8" O.D. 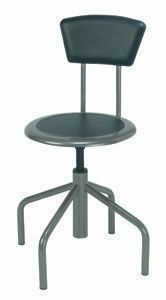 tubular steel fixed height stools in 18", 24" and 30" heights. The seat is a full 14" diameter with an 11 1/2" masonite board recessed into the seat pan, and will not chip or crack. Padded backrest is 6" high and 12" wide, and adjusts up/down, forward/backward. A rugged utility stool on a traditional American style base. 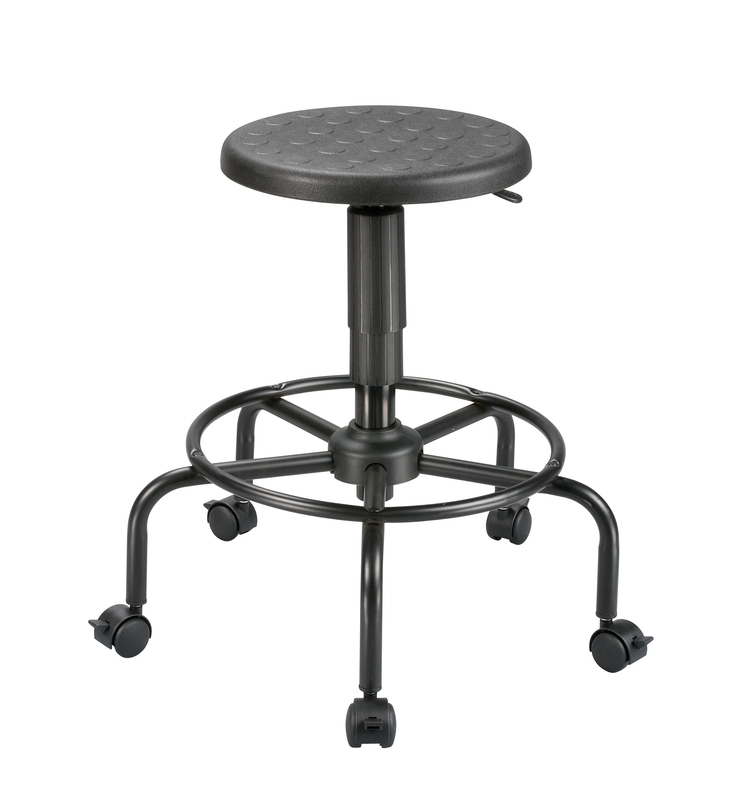 Features a firm 1" thick black polyurethane swivel seat that is 13 1/2" in diameter. provides excellent stability and comfort with it's built-in foot ring. Complete with a set of locking casters and a set of non-slip floor glides. Suited for rugged educational environments. 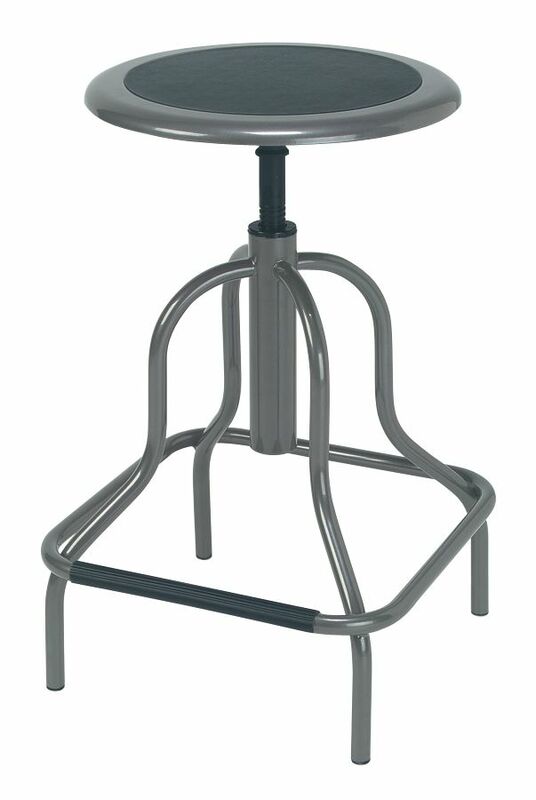 Steel frame with clear-coat pewter finish, non-marring rubber feet. 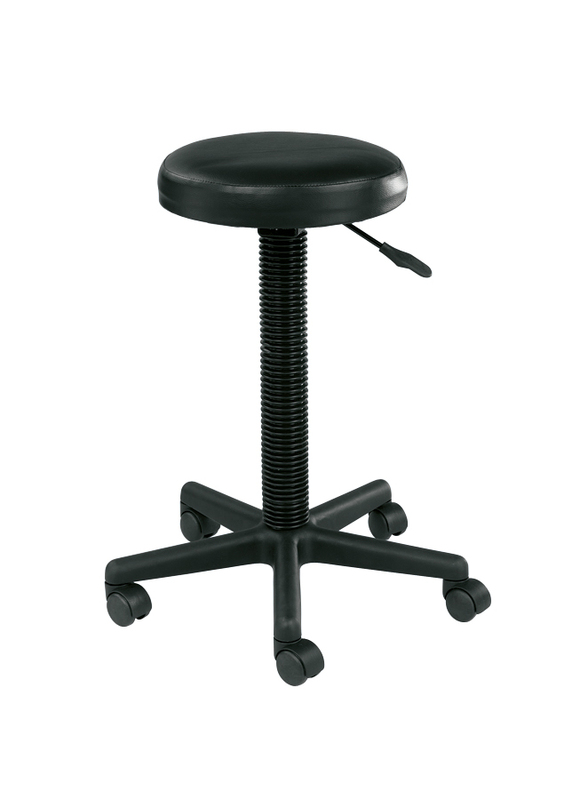 Nylon coated screw lift manually adjusts the vinyl padded 14" diameter seat. 12" wide x 7" high steel back. 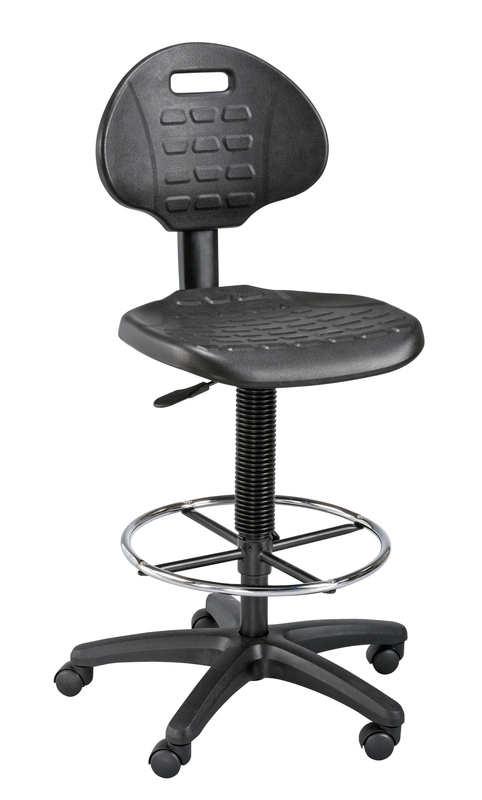 High base stool adjusts from 22 1/2" to 28 1/2", low base stool adjusts from 16" to 22".